For nearly 50 years, Jack Catlett (center) has been a mainstay of the Transmission/Station group at PSO…for 31 years as an employee and for the past 17 as a retiree/contractor. In that time, he’s mentored many young engineers, including the two flanking him in photo. At left, is Rick Gurley, manager-Protection & Control Engineering; at the right is Shawn Robinson, director-Station Engineering. Jack Catlett’s career in Transmission engineering spans the second half of Public Service Company of Oklahoma’s (PSO) existence, starting in 1963 as the company marked its 50th anniversary, and continuing through to its centennial. As Inside PSO continues its salute to the company’s 100th anniversary and the employees who have contributed to its success, we are pleased to bring you a profile of this unique individual. “Mentor” is a term many electrical engineers in the AEP transmission group in Tulsa use when describing Jack Catlett…an engineering professional who officially retired in 1994 after a 31-year career but returned to the job as a contractor after a two-year break. Seventeen years later, the 76-year-old Catlett is still at it doing electrical design work and “showing the ropes” to yet another new generation of engineers. A native of Fairfax, Okla., Catlett began his career in the electrical field as a technician in the U.S. Army during the Cold War years, maintaining 5-kilowatt generators that powered a surface-to-air missile battery located in Thule, Greenland. 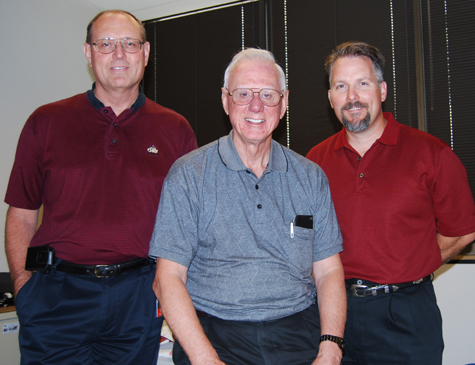 After he got out of the Army in 1963, Catlett started with PSO as a Protection & Control (P&C) technician in Lawton. One year later, he transferred to the P&C group in Tulsa where he worked for the next 10 years. In 1974, as PSO began to install Supervisory Control and Data Acquisition (SCADA) capability in many of the existing substations, Catlett was among several experienced field technicians tapped to do the design work. After his involvement with the SCADA project wrapped up, Catlett transferred to the Substation Design department, where he performed design work on substations across PSO and also some for PSO’s sister utility companies in Texas. He retired in 1994…but not for long. He returned in 1996 as a contractor to help with a project, and ended up staying on the job part-time. Today, he typically works three days a week as part of the Protection & Control Engineering group, headed by manager Rick Gurley. Inside PSO sat down with Catlett recently to ask him a few questions about his career. IPSO: Why did you decide to stick around after you returned in 1996 to help with a project? Catlett: Being retired was nice but I was ready for something more challenging. I also enjoy the work and my co-workers…plus the pay isn’t bad. IPSO: What does your family think about your having a “second-career” with PSO? Catlett: They have been happy about it because I’ve enjoyed it. It has also enabled us to do some things that we might have not been able to do otherwise. IPSO: You are well-known for your role in mentoring young engineers. What attracts you to the mentoring role? Catlett: In my view, it’s all part of the job. It’s also a two-way street. It’s the willingness to impart knowledge you have to someone and receiving knowledge from them no matter who is the most experienced. Some of the best advice I have received has been from new engineers with little or no actual experience in the electric utility business. I can’t speak for other companies but I believe that the one thing that makes this a great company to work for is that the people take great pride in the quality of their work; therefore, who the knowledge comes from to accomplish the job is never the issue. IPSO: Did you have any mentors who helped you along when you started at PSO? Catlett: Practically everyone I have worked with was my mentor in one way or another. If I was to pick someone, it would be Don Johns, a P&C technician in Lawton, who taught me about the job, and also Rube Shirk, my P&C supervisor in Tulsa who told me to never stop learning and take pride in my work. IPSO: Do you see any differences between young engineers today compared with when you started? Catlett: I’ve been fortunate to work with top-notch engineers throughout my career. I do believe today’s new engineers seem to have a better understanding of the electric utility business straight out of college compared to the past. That could be due to some of the college courses that are offered today. The one thing they’ve all had in common is their good work ethic. IPSO: Are there any particular learning points you make when mentoring a young employee? Catlett: Never pass the buck. People are not interested in who “did it” but who’s going to solve it. IPSO: Do you have a second retirement date in mind? Catlett: I will probably be retiring sometime in October. I have a couple of projects I want to finish first. IPSO: Is it possible to sum up your 48-year career? Catlett: The one thing I would say is that I feel very blessed to have worked for this company as long as I have, both as a field technician and design engineer.